I can’t tell you how many riders I speak to every week that are looking for that perfect leather jacket: slim-fitting, simple, and timeless, made of quality materials that will last a decade and employing protection that will keep them safe for the life of the garment. Usually images of action movie heroes accelerating on sport bikes as an explosion roars behind them are conjured. The crazy thing is, there aren’t a whole lot of jackets that can check all those boxes. Thankfully, there is a new contender. Dainese, the kings of Italian leather, are rolling out the new Dainese Stripes D1 Leather Jacket. This is one jacket that just screams high-class. Subtly adorned with only one blacked-out Dainese logo at the upper-back, this will surely be a go-to choice for the riders who aren’t sponsored and don’t want to look like they are. Right out the box, the Stripes D1 is going to feel like you’re putting on your favorite jacket from years past. 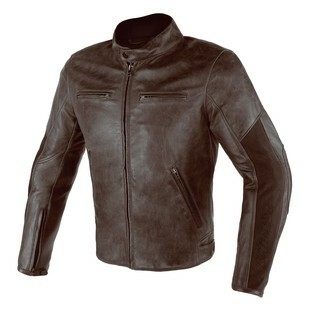 When Dainese does soft “Vintage” leather, they really do it right, and the look is tied together with a few suede panels. Air vents placed on the chest, and a removable thermal liner ensure you are always feeling as cool as you intend to. Last but most certainly far from least, this jacket includes both shoulder and elbow protection, and the entire garment is certified CE - Cat. II - 89/686/EEC Directive, which is HARD to come by in a jacket that isn’t explicitly designed for race use. Dainese really went for it here, while restraining themselves enough to create a jacket that looks timeless rather than a MotoGP replica. Well done, I say. We need more brands taking riding gear into the future without looking quite so… futuristic. I think this one will be a hit.